The Value of Camp – Now more important than ever! Summer camp…a time tested American tradition is very possibly more important today than ever before! There exists today a great deal of data on the value of play in child development. Kids need exercise; they need opportunities to be creative and unstructured time to play with peers. At Pierce, we have developed a program to teach and integrate 21st Century Skills into our daily programming here at camp. It is our strong opinion that pushing the core competency skills within the 21st Century Skills movement will benefit both our campers and staff. At Pierce, we UNPLUG, greatly reducing the amount of technology consumption. In an unpluggegd environment, camp helps children develop emotional self control, allowing them to find connections within themselves, a vital part of growing up. Camp also provides a unique environment for kids to learn how to share, co-create and collaborate with one another, developing friendship skills along the way. We will be working on and encouraging our campers on a list of skills…Kindness and Respect, Responsibility, Creativity, Leadership, Cooperation, Communication, Flexibility, Adaptability, Self control, and Teamwork. Here at Pierce, we view ourselves as Child Development Professionals. We will all enjoy watching the progress and personal growth our kids make this summer on our fields, in our pools and at our program areas. Camp is the place where this can and will happen. Sport plays a big role in teaching values and principles. Teamwork, leadership, work ethic, sportsmanship, and trust are all part of the game and are factors in how we make the most of our lives. Through sports, kids can see the results that come from repeating certain skills in order to perfect them. They develop a more positive self-image through personal achievement and learn that if they spend enough time on a task they will eventually become better at it. 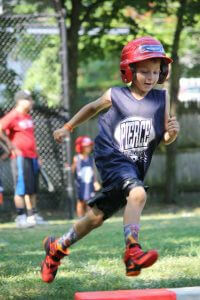 At Pierce, we stress fundamental skill development through our extensive daily schedule and specialized clinics. Our goal is to help the young people of today learn these lessons in order to have better lives tomorrow.